Check out the Minis on our kickstarter page! A 2-4 player game of magic, monsters, and miniatures where you seek to defeat your rivals and rise to become the ultimate ARCHMAGE! 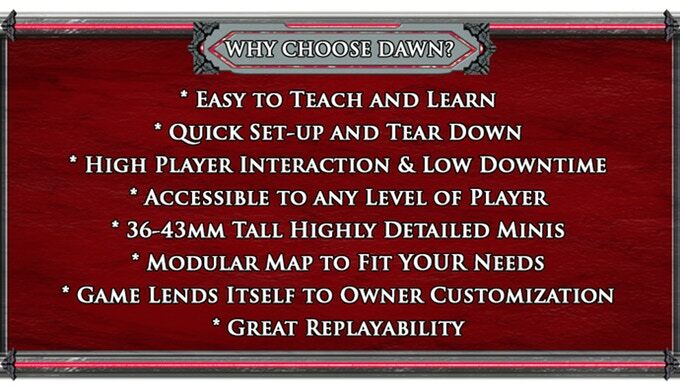 Dawn of the Archmage continues the rich fantasy world of Archmage Origins. Once the rulers of Sorcado, mages have fallen from power and challengers arrive from every corner of the land. Knighted Paladins, land-hungry Lords… all seek to dethrone the mages. But mages don’t go down easily. It’s time to fight back! Each mage uses summoning powers to bring new and dangerous creatures to the battlefield. Expending massive mystical energy, their battle grows in frenetic power as monstrous beasts fight for the mages who control them, seeking to destroy all challengers in a magic-fueled frenzy. Ultimate power hangs in the balance as ferocious monsters shake the earth with battle-lust. In addition to summoning fearsome creatures to fight, mages possess a selection of powerful spells. With a single word, the battle can shift. Manipulating odds, controlling movement, and countering rival spells, the mage’s strategy will determine the supreme ruler of Sorcado. The battle rages everywhere. Modular map tiles allow the mages to customize the battle area. Large, sprawling battlefields or close, confined ones… the fight is different every time. Will it be the Arena? The Forest? The Ruins? Or even Underground? Do you have the strength and strategy to defeat your enemies? Will you become the supreme Archmage?